Blue Apple Books, 9781609055011, 72pp. 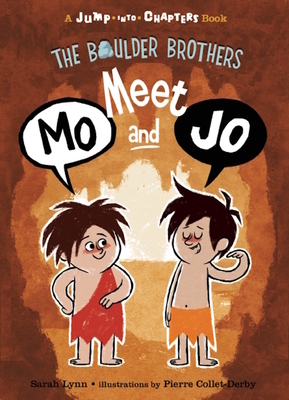 Mo and Jo, aka the Boulder Brothers, join JUMP-INTO-CHAPTERS with a series of pre-hysterical escapades. In the first chapter, Me Stink?, something's smelly Is it Jo? Is it Mo? Is it both? Though kids will know who's the real odor-offender, they'll have fun watching the caveboys try to figure out the source of the stench. Hide and Peek, Chapter 2, has Jo teaching Mo how to play his favorite game. But does Mo really not understand the rules? Or is he a peek-and-cheater? And who will have the best ideas for warming up in Me Cold ? Will a prehistoric beastie mind when they try to borrow some fur? Though Mo and Jo both speak caveman-ese, educators can be assured that the accompanying narration will offer kids a correct rendition of grammar and sentence structure. Sarah Lynn: Sarah Lynn was born in Hollywood and now lives in Camarillo, CA, with her husband and three sons. As a clinical social worker, she provides mental health services within the Ventura County schools. She also has a small private practice in Thousand Oaks. Sarah writes under her first and middle name, because it's just so mysterious and fun! Pierre Collet-Derby: Pierre Collet-Derby is a Montreal-based animation artist and children's book illustrator.